Few would argue that Walt Disney was a man ahead of his time. Always looking to the future, he was a pioneer in movies, television, theme parks and even urban development. And’s that exactly what Disney did. Today, Disneyland is as popular as ever, and no one is concerned that is was built more than half a century ago. Disneyland is both nostalgic and cutting edge, both quaint and thrilling, and both familiar and new. There were those that tried to copy Disneyland’s success, and met the harsh realities of derivation. Rather than learn from Walt and try to create something that will stand the test of time, they merely tried to imitate him without any substance. Instead of creating something timeless, they created something soulless. Nara Dreamland is just such a place. 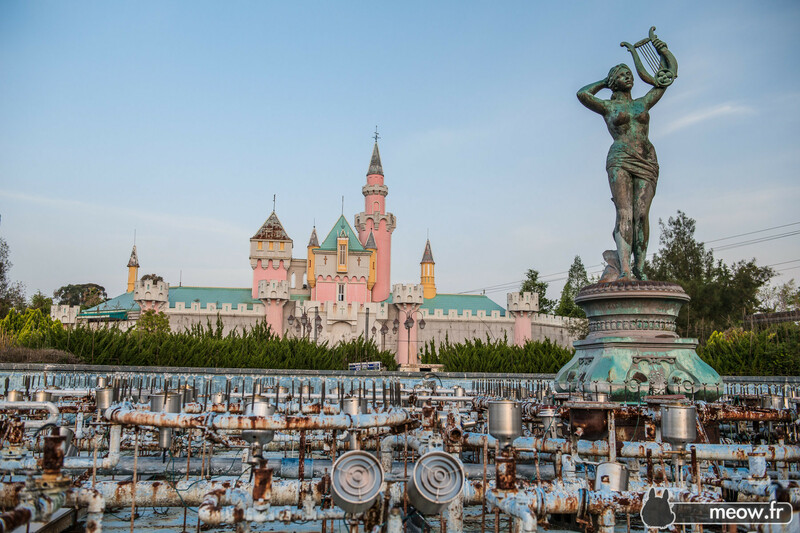 Nara Dreamland was built in 1961 and was disturbingly similar to Disneyland. The entrance to the park was almost identical, with the tunneled entrances under the train depot, a Victorian-inspired Main Street that led to a “hub” and, of course, their version of Sleeping Beauty’s Castle. There was also the Dreamland versions of the Matterhorn, Autopia, Jungle Cruise, TeaCups, King Arthur’s Carousel, Monorail, Skyway and more. Why did Nara Dreamland fail? Surely, this seems to be a ridiculously obvious question. How could such a blatant, unethical imitation ever find public acceptance? Clearly it failed because the the customers saw right through the ruse and avoided it like the movie “Gigli”, right? The park was reasonably successful, and in fact, was open nearly as long as Disneyland before it closed – 45 years of almost being the Happiest Place on Earth. So where did Dreamland go wrong? Nara Dreamland closed five years after Universal Studios Japan opened. Let’s take the lessons we have learned from Walt and apply them to our digital products. Is your digital product a thriving, bustling Disneyland? Or is it a neglected ruin, like Nara Dreamland? If your product cannot be instantly and effortlessly updated, I’ve got some bad news… Get ready to be bulldozed. It is absolutely imperative in this day of instant information to keep a live-connection to your products. Whether it is an ebook, a video course, a game, an app or even software, there has to be a system in place to allow for updates. When you update your product, even in the smallest way, you are sending a message to your customer that you actually care. You are assuring them that they made the right choice buying your product, and they will be more likely to purchase from you again. There are many more benefits to live-connected products, which will be the subject of my forthcoming book, Synced: A Visionary Approach To Turning Your eBooks, Videos And Content Into Live Broadcasts, Your Customers Into Lifelong Connections, And Your Business Into A Marketing Machine. And of course, that book will never be finished, as long as there is information left in the world. Don’t allow your digital products to live in a Dreamland. Stay connected like Disneyland, and make sure they are the Happiest Products on Earth!